Gastone Moschin (8 June 1929 – 4 September 2017) was an Italian actor. He was born in San Giovanni Lupatoto (Veneto). Moschin began his career in the 1950s as theatre actor. He starred with Barbara Bouchet in Milano Calibro 9 in 1972. 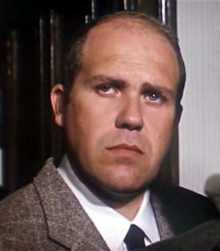 His most famous role is that of Rambaldo Melandri in the Amici miei series (1975–1985). He also had a part in Francis Ford Coppola's The Godfather Part II, as Don Fanucci. Moschin died of kidney failure on 4 September 2017 at his home in Terni, Italy at the age of 88. This page was last changed on 20 December 2017, at 05:58.